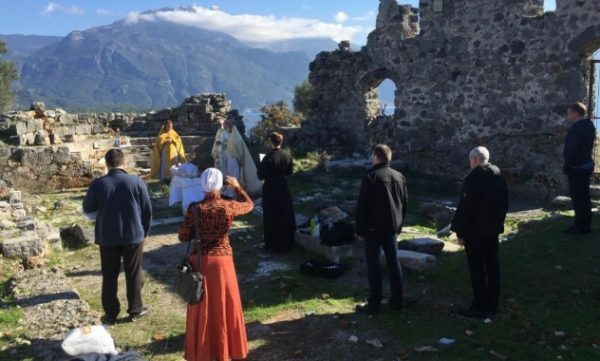 On 20 December 2018, Divine Liturgy was celebrated on St. Nicholas Island located in the Turkish Gulf of Fethiye. Rev. Georgy Sergeyev, rector of Ss Constantine and Helen church in Istanbul who cares for the Russian-speaking believers in the Republic of Turkey, officiated. A group of pilgrims from the Pskov and St. Petersburg metropolias attended. St. Nicholas Island (Turkish name:Gemiler Adasi), located off the coast near the city of Fethiye, is home to the remains of four Christian churches built in the 4th-7th cc. along with some forty Christian buildings. A legend holds that the settlement was founded by St. Nicholas the Wonderworker who fled here with his flock from the Romans. It is believed that one of the churches was built in honour of the saint as his name can be found on its wall. Some legends hold that St. Nicholas was interred on the island that was used by Christian pilgrims en route to the Holy Land. The relics, which remained here until the 7th century when the island was abandoned as it was threatened by the Arabs, were removed to Myra and later to Bari in Italy where they rest at present. Gemiler Adasi is a desert island listed by the Turkish Ministry of Culture and Tourism.